The 3Star Protest World Rookie Fest in Livigno opens the inscription. January 16-20, 2010 the best youngsters from all over the worl will land in the Swatch Snowpark Mottolino and challenge for a ticket to a freeride filming trip in Chile. This legendary event, promoted by WSF and Swatch TTR, will push again the concept of “From Rookie to Pro System” inviting the best youngsters where all international talent scouts have been eagerly awaiting for one year: Snowboarding, the future is Here! 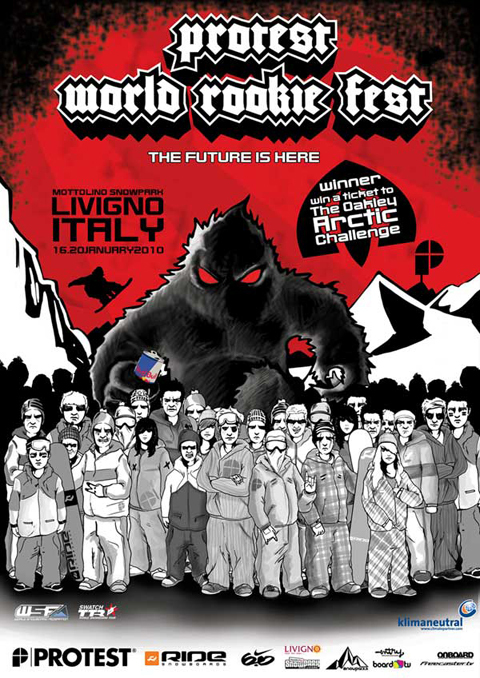 The over 100 awaited participants from 15 different countries, are turning this event not only into the jewel in the crown of the Swatch Snowpark Mottolino in Livigno, but also into a worldwide top event: it is indeed recognized as the most prominent youth competition of the season, with amazing prizes for the winners. The contest in Livigno is a unique opportunity to see the best young athletes in action in the same day on the same slope style. The riders will be split into two categories: Rookie, those who were born between 1 January 1992 and 31 December 1994, and Grom, who were born after January 1, 1995. Both male and female. The event in Livigno is not just about the contest: beyond the slope style, the Protest World Rookie Fest features fun and learning activities. Rookies can obviously take part in both parties and courses on environmental education. Moreover, the Protest World Rookie Fest gives the young talents a valuable opportunity to experience first-hand what it means to be a professional snowboarder: riders will be engaged in video and photo shootings, becoming protagonists of an official TV production and will also meet international team managers and professionals in the field. Participants are all strictly pre-selected in their home countries through regional qualifying heats, ensuring that only the most promising riders can take part to this event. The overall technical level of the Protest World Rookie Fests has reached legendary peaks: double cork, double front flip and cab 1260 are just some of the insane tricks performed in the last editions. The riders’ list was always really impressive, featuring names such as Red Bull rider Dimi de Jong, last year’s italian discovery Marco Grigis, former World Rookie Champion Roope Tonteri from Finland, norwegian talent Staale Sandbach and many other. During the upcoming event in Livigno, awesome prizes await the best riders: 1 ticket to the Freeride Rookie Fest in Chile, august 2010, a one-in-the-life backcountry filming experience on the Andes, togheter with international pros and professional film production company. In addition 5 invitations to the Protest World Rookie Finals 2010 in Ischgl, Austria and snowboard goodies offered by Protest Boardwear and Ride Snowboards. If your dream is to become a professional snowboarder your future starts from the Rookie Fest! Prize 1 Ticket to Freeride Rookie Fest in Chile, august 2010 // 5 ticket to Protest World Rookie Finals 2010 in Ischgl, Austria // Snowboard goods from Protest Boardwear and Ride Snowboards // Trophies. Qualified Riders National team athletes registered directly by National Federations members of the WSF (the list is published on www.worldsnowboardfederation.org). Italian athletes will be selected through the Italian Rookie Tour. 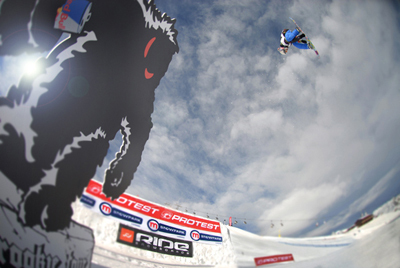 Rookies who will get to the BEO finals in Laax and will not able to attend Rookie Fest qualifications, will be directly granted participation to the Protest World Rookie Fest finals in Livigno, on January 19, 2009. Inscription The inscription must be made by the National Federations for the whole “National Rookie Team”, by sending the inscription form to rookie@worldsnowboardfederation.org within January 6, 2010. Entry fee: For RIDERS it is 350EURO all inclusive: inscriptions, lift tickets, 4 nights in half board (breackfast and dinner) in 3Star Hotel, gift from sponsors, party pass. In addition 30EURO deposit for each bib. For Coach and Parents it costs 300EURO all inclusive. ALL TO BE PAYED CASH AT THE RACE OFFICE ON THE ARRIVAL DAY OR BY BANK TRANSFER BEFORE THE 10 JANUARY 2010. Without Accomodation the entry fee is 100EURO included 3days lift ticket. Accomodation 3Star hotel in halfboard from 16 january to 20 january is included in the entry fee. Livigno Tourist Office will be in charge of booking hotel accomodation for athletes and those who accompany them. In the inscription form you have to specify whether you are looking for accomodation. The name and address of your hotel will be given to you few days before the event per e-mail or directly to the Race Office. Invited riders Thanks to the results they have obtained during the Protest World Rookie Finals 2009 and the Protest World Rookie Fest 2009, the following riders are invited to the Protest World Rookie Fest 2009 in Livigno free of charge (inscription fee, accomodation and meals): Roope Tonteri (FIN), Staale Sandback (NOR), Bibi (ITA), Dimi de Jong (NDL), Eskil Korneliusen (NOR), Kevin Backstrom (SWE). Sponsor&Partner: Protest Boardwear, Red Bull, Ride Snowboards, Nike6.0, Snowpark.it, Swatch Mottolino Snowpark, Livigno Turistic Office, Livigno Skipassion, freecaster.tv, Onboard European Snowboard Magazine, Entry, Board.TV.